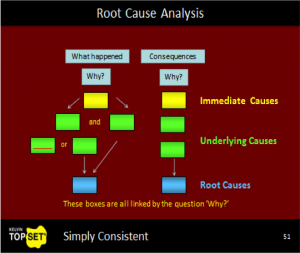 Root Case Analysis (RCA) is one of the most commonly misunderstood terms worldwide. 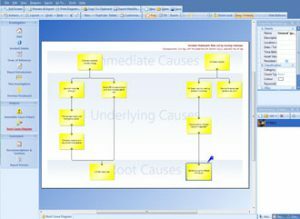 Many companies and individuals request Root Cause Analysis training when what they actually want is a comprehensive accident investigation system. Kelvin TOP-SET provides this system, and the RCA is only part of this package. The RCA is part of the reporting procedure. It is a logic flow diagram, summarising the events and failures uncovered in the investigation, and linking the incident through Immediate and Underlying Causes to the Root Cause(s) of the problem. As a consequence, the RCA should only be started when an investigation is completely finished. For various reasons, an Investigator may be encouraged to come up with an RCA and make recommendations, based on limited information. We have all heard the phrase, “We all know what has happened here”, and the temptation is to make the RCA fit this early conclusion. To achieve this would require the Investigator/Team to ignore other areas where problems may lie, and perhaps even to ignore evidence simply to make things fit the early diagnosis. What is the value of an RCA? 1. It provides a straightforward summary of the events leading up to an incident, starting from the Root Causes, through the Underlying Causes to the Immediate Causes which caused the incident to occur. i.e. It links all the issues which led to an incident, in a simple, logical and evidential way. 2. Most of the steps in an RCA provide opportunities to consider fixes. A ‘fix’ is a control, barrier or defence you might wish to put in place to ensure the same, or similar events don’t happen again. These are made in the form of recommendations, or SMART actions. That’s not to say that every step needs a SMART action, but they can be considered and discussed. 3. Finally, the RCA acts as a summary or précis or abstract, which can be read by a senior manager, without necessarily having to read a full report. One of the most important parts of the RCA is getting started. This starting point is the identification of the Incident Statement (IS). Get this wrong, and the whole logic flow diagram and associated recommendations could be wrong. A good IS will ensure that all aspects of the investigation which you have uncovered, appear in the subsequent analysis. Root Causes are what lie at the heart of the problem. This is what allowed the situation to arise in the first place, and this will be in the areas of People and/or Organisation. It is here that the actions, or more often inactions that led to the general conditions which caused the incident, can be found. It is these Root Causes, with their impact on the general conditions, that enabled the incident to occur. Do be rigorous in identifying the 'Root Cause'. Everything may appear down to management, but try to be specific. The wording of the Root Cause is very important. Simple phrases like “Poor management” don’t endear you to senior managers and don’t provide enough information about the problems which need attention. Don’t be seduced into thinking that because you have identified the technical failures you have found the 'Root Cause'; you haven't. Please recognise that this must be somewhere in the People and Organisational sectors. A snapped chain, blown fuse, or lost key can never be a Root Cause. Do write the recommendations as SMART Actions, and ensure these are linked to specific events in the RCA. For those of you using our 'Investigator 3' software there is a useful number-tagging facility that links the RCA to the recommendations in the final report. To conclude, Root Cause Analysis is simply one part of the full investigative process. It is where you summarise what has happened by linking the causes in a logical way and showing how they contributed to the event under investigation.